Comments - Great illustration from the kabuki play commonly known as "Sanza Rotaku" showing the two arch enemies Nagoya Sanza and Fuwa Banzaemon encountering each other in the Yoshiwara at night. Entrusted by his lord with the care of a precious scroll, Sanza was banished from his clan after the scroll was stolen by the evil Banzaemon, who appears at right dressed in a black robe with a bold design of swirling clouds and red lightning bolts. He lifts the rim of his hat, frowning angrily as he recognizes his foe. 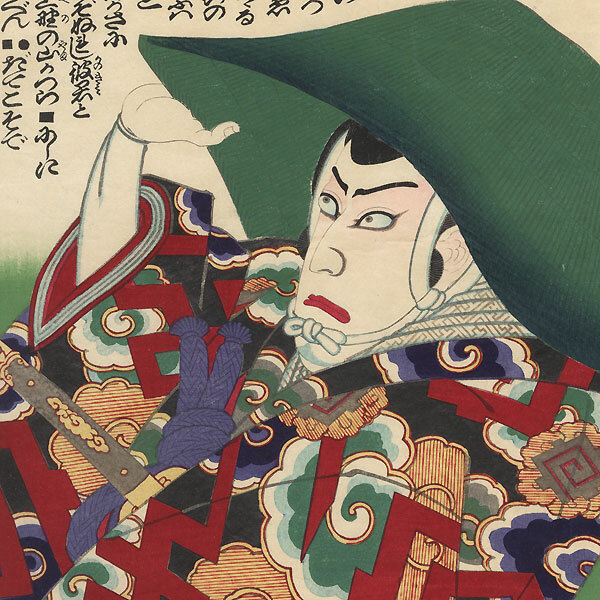 At left, Sanza likewise grimaces as he glares at the samurai, wearing a purple kimono patterned with swallows in flight and slanting raindrops. A man caught between them stares back at Sanza, a robe draped over his shoulder. The background is shaded from red to white to green. 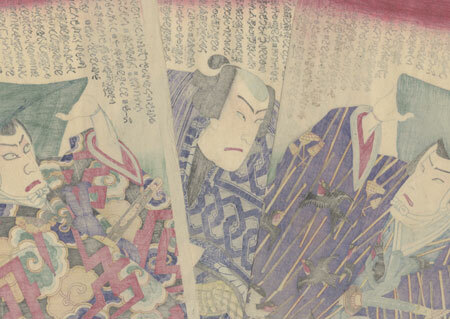 From left, the actors are Suketakaya Takasuke, Onoe Kikugoro, and Ichikawa Danjuro. A colorful interpretation of this famous tale, nicely detailed with burnishing on the black robe. Condition - This print with excellent color and detail as shown. Three separate panels. A few pinholes, repaired. Slight soiling, a few creases at edges. Please see photos for details. Good overall.